Fantasy Football Week 3 Cheat Sheet: Who Are Buy-Low Trade Candidates? Which struggling players are expected to bounce back? And whom from the crop can you poach from a rival owner in your league? The third week of the season is when the haves and have-nots start to separate in fantasy leagues. After this week, some people will be 3-0, while others will be 0-3. Even owners who don’t fall into one of those two extremes will have a good idea of their team’s strengths and weaknesses, and what they need to do to capitalize on the former and remedy the latter. As such, it isn’t a surprise that trade activity picks up between Week 3 and Week 4. With that in mind, we asked our fantasy experts the following question in advance of Week 3. We typically see trade markets in fantasy leagues pick up after Week 3. Who's a player you'll be monitoring this week with an eye on making a trade for him next week? John Paulsen: One potential trade target that jumps out is Michael Thomas. He hasn’t played poorly—10 catches for 134 yards in two games—but he has yet to find the end zone and has a fairly tough matchup in Carolina this weekend. If he has another so-so week, it’ll be a great time to strike since his remaining schedule is very favorable. Starting with Week 4, Thomas will face the Dolphins, Lions, Packers, Bears, Buccaneers, Bills, Redskins and the Rams before facing the Panthers again in Week 13. Sure, there are a few tough shadow corners on that schedule, but it’s far more good than bad. Then, to top it all off, he faces the Falcons twice in the fantasy playoffs, with the Jets sandwiched in the middle. Those three fantasy playoff games will be played indoors, while many of his peers will be braving the nasty weather that often hits in December. Michael Beller: I love the Thomas call from Paulsen. If he has a slow Week 3 against the Panthers, I will definitely be checking in with his owners in my leagues. I’ll keep the receiver idea rolling with a pair of guys who will be on the same field on Sunday. First, the bigger name of the two. Doug Baldwin has gotten off to a slow start this year, catching 10 passes for 107 yards. His struggles are symptomatic of Seattle’s offensive woes thus far, so there’s little reason to be concerned about Baldwin, the player. As I laid out in this week’s Target and Snap Report, Baldwin is among the league leaders in creating separation this season. As a receiver, all you can do is run your routes and get open. Baldwin is doing that with regularity. Seattle’s offensive line is the largest part of the problem here, and that’s a silver lining for Baldwin. The team will need to find answers in protection but Russell Wilson and, by extension, the Seahawks passing game, is too good to be contained forever. As Wilson gets going, so, too, will Baldwin. It’s always harder than it seems to acquire a player like Baldwin, who had significant expectations heading into the season, even after he puts together a couple of substandard statistical performances. Baldwin, however, wasn’t quite in the elite group of receivers during draft season, so it’s entirely possible his owners will sour faster than, say, A.J. Green’s owners. The Seahawks are three-point underdogs to the Titans on Sunday, and they have a relatively low implied total of 19.75 points. Another touchdown-less game for Baldwin will make him an attractive buy-low receiver that you could realistically pry from his owner. On the other side of this game is Eric Decker, who has not provided the boost to the Titans passing attack the team expected. Decker was held almost completely quiet in Week 1, catching three passes for 10 yards. He followed that up last week with another three grabs, these going for 32 yards. Now, he draws a Seattle defense that is still among the best in the league and held Aaron Rodgers and the Packers largely in check in Week 1. It wouldn’t be a surprise to see Decker struggle again this week going up against Seattle’s secondary. If that does indeed come to fruition, chances are he would be eminently available. The average fantasy owner isn’t clamoring to hold onto someone who is likely his fourth or fifth wide receiver and was selected in a double-digit round. Acquiring Decker at his low point would be a boon for any fantasy owner savvy enough to pull off the deal. First and foremost, Decker is getting plenty of targets, netting 13 looks from Marcus Mariota in the first two weeks. Secondly, the shoulder that cost him nearly all of the 2016 season has not been a problem this year. In other words, there doesn’t appear to be an injury at play here. Decker didn’t suddenly forget how to score touchdowns. He’ll be back in the end zone sooner rather than later. The Titans get the Dolphins, Colts and Browns in the middle of their schedule, a return matchup with the Colts in 12, and a date with the 49ers in the fantasy semifinals. Decker is going to pay off in a big way even if he struggles again on Sunday. Jennifer Eakins: Looking down the road at strength of schedule, the Falcons receivers have a spongy-soft path toward the fantasy playoffs, continuing through the fantasy championship in Week 16. Beginning with their matchup against Tampa Bay in Week 12, Atlanta gets five games in a row against teams that have given up massive yards to opposing wide receivers this season. They face the Buccaneers twice in that time frame (once during the fantasy playoffs), a defense that allowed 301 yards to Chicago unimpressive collection of pass-catchers in Week 2. They also draw the Saints with twice in that span, including in Week 16. The Saints surrendered a whopping 793 total yards to pass-catchers through the first two weeks of the season, and could go down as one of the worst against the pass in recent memory. Julio Jones has started slowly for his standards, putting up 26.4 PPR points through two weeks, making him WR18 in those formats. His owners may be getting a bit restless and could part with the stud wideout for less than he’s actually worth. I’d also consider making moves for Mohamed Sanu, who is flying way under the radar, but currently has more targets than Jones after Atlanta’s first two games. We’ve all seen what happens when Matt Ryan’s arm gets hot, and I want a piece of the action down the stretch. T.J. Hernandez: Drafted as the RB20 this offseason, Mark Ingram is currently the RB26 in standard leagues and RB18 in PPR leagues. Public sentiment toward the Saints offense is at an all-time low, making it a perfect time to pounce. Through two games, Ingram is playing 48% of his team's snaps, slightly up from the 46% he's played each of the past two years when he's finished as a fantasy RB1. When in a neutral game script—meaning the game is within a single score—New Orleans has run the ball at the second-highest rate of any team in the league thus far. After their Week 5 bye, the Saints have one of the softest remaining fantasy schedules for running backs, including a run of six straight games against teams ranked in the bottom half of the league against the position. When making trades this early in the season, the ideal trade partner is someone that started 0–3 and is already in desperation mode. Consider unloading positional players whose output is far exceeding their volume or quarterbacks posting unsustainable early-season scoring rates. Some players that stand out as possible sells include Trevor Siemien, Alex Smith, Chris Thompson, J.J. Nelson and Nelson Agholor. Chris Raybon: Joe Mixon. With the Bengals firing offensive coordinator Ken Zampese and hiring Bill Lazor, it's possible that Lazor jettisons Jeremy Hill from the three-way committee lets the talented Mixon handle more of a feature-back workload. 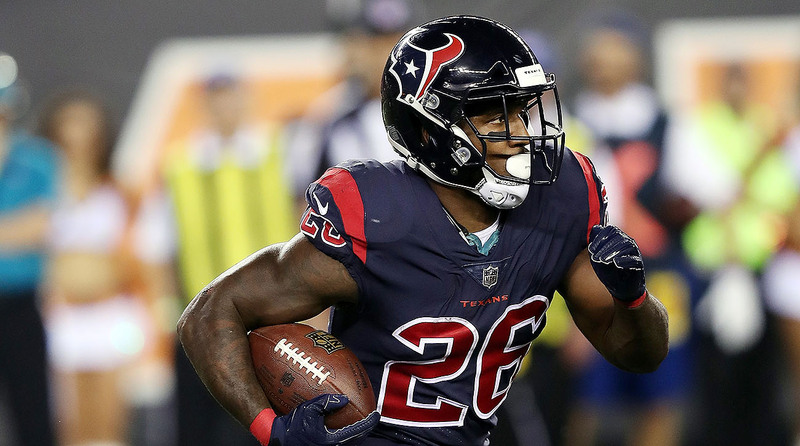 ​You can never have enough running backs in fantasy, so I'll be looking at how Chris Carson, Derrick Henry​, and possibly Samaje Perine and Orleans Darkwa handle increased roles this weekend. Zach Ertz is on a streak that helps make him an elite play in DFS contests for Week 3. The Chicago Bears defense should be no match for Le'Veon Bell this week. Jonathan Stewart may not be exciting, but he should be in your fantasy football lineup in Week 3. Trevor Siemian, fantasy's top quarterback through two weeks, is a great streaming option in Week 3. The inefficiency of Jacksonville's passing game has yet to hold back Leonard Fournette.